Upchurch's Hardwood Flooring makes it easy to transform your home or office into a regal, new space. When it's time to make the change to a longer lasting flooring solution, simply contact us. We sell and install the hardwood flooring of your dreams. Our dedicated sales and installation teams serve residential and commercial customers in Johnson City, Tennessee, and the surrounding area. Simply put, a hardwood floor brings out the beauty of your property's interior without all the complexity. Unlike carpet, hardwood flooring cannot trap allergens, dust, dirt, or pet dander inside its fibers. This drastically reduces the presence of foul odors and irritants inside your property, which results in a more comfortable space for your guests. Maintenance is also a breeze. Our hardwood flooring options feature a no-wax finish that only requires a damp mop to clean. Hardwood floors are more environmentally friendly too. You don't have to use shampoo or other harmful cleaners to retain its everlasting shine. When it's time to make the change, we're with you every step of the way. Our sales representatives direct you to the flooring options that bring out the natural aesthetics of your property. Simply call us for further details and pricing information. 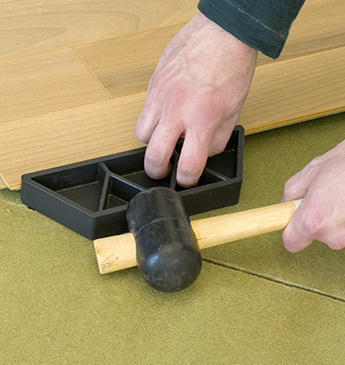 Our experienced team of flooring specialists is on-hand to install your flooring. Whether it's a single room or the entire interior, we cover any area you want. Each service begins with a free estimate, so you always get what you expect from us.